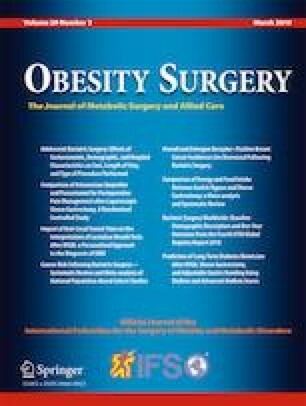 To investigate the perception of hunger and satiety and its association with nutrient intake in women who regain weight in the postoperative period after bariatric surgery. Cross-sectional study of adult women divided into three groups: weight regain (n = 20), stable weight (n = 20) (both at least 24 months after Roux-en-Y gastric bypass surgery), and non-operated obesity (n = 20). A visual analogue scale measured hunger/satiety perception while fasting, immediately after finishing a test meal, and 180 min after finishing the test meal. The incremental area above or under the curve was calculated. Food intake was analyzed by 3 days of food recall and adjusted for intraindividual variation. To make between-group comparisons, Mann-Whitney, ANOVA, Kruskal-Wallis, and independent-samples T tests and Pearson’s correlation were used. There were no between-group differences in incremental areas of hunger/satiety, but protein intake was significantly lower among patients who regained weight compared with those who had stable body weight (0.99 ± 0.23 g/kg body weight vs. 1.17 ± 0.21 g/kg body weight, p = 0.047). In the group that regained weight, satiety was correlated positively with usual dietary protein density (r = 0.541; p = 0.017) and negatively with usual carbohydrate intake (r = − 0.663; p = 0.002). Women who regained weight presented similar perceptions of hunger/satiety to those of patients without weight regain and with non-operated obesity. In patients who regained weight postoperatively, satiety perception was correlated positively with usual dietary protein density and inversely with usual carbohydrate intake. We thank Richard Lipkin, PhD, from Edanz Group (www.edanzediting.com/ac) for editing a draft of this manuscript. This study was funded by Foundation for Research Support of the Federal District – Brazil (FAPDF), no. 10569.56.30088.09042016. Informed consent was obtained from all individual participants included in the study. All procedures involving human participants were in accordance with the ethical standards of institutional and/or national research committees and with the 1964 Helsinki declaration and its later amendments or comparable ethical standards.